CoverGrip™ is the ingenious new drop cloth that simply and elegantly provides protection, not just to the beautiful surfaces in our homes, but also for the people who work and live in them. CoverGrip™ solves both problems at Once in a way that's so simple, it's surprising that no one has ever thought of it before. Innovative CoverGrip™; the dots are the difference. CoverGrip™ drop cloths are manufactured with thousands of tiny, rubberized dots, firmly attached to the bottom of each protective cloth. These dots are slightly rounded, which is what makes them so effective. There's nothing in the dots themselves that causes them to stick to a slippery floor, but Once pressure is applied the rubber dots grab and hold firm, like sneakers on a basketball court. And because they're rounded, the dots continue to hold, gripping tight even when under a shifting load. The rows of dots also enable CoverGrip™ drop cloths to easily fold and conform to surfaces, like stairs. CoverGrip™ folds perfectly, inch right on the dotted lines," to fit Snugly on stairs, into corners or anywhere they're needed. Once positioned, they inch hold their fold" to stay in place. No more inadvertently exposed surfaces. But although CoverGrip™ drop cloths hold fast, there's nothing "sticky" about the dots. You can easily move a CoverGrip™ drop cloth around to reposition it whenever you want; they move with ease. But when they're under a load you can't make CoverGrip™ budge. Finally when you're done, just pick up your CoverGrip™ and put it away. It can be machine washed (the dots won't Fall off) or just folded up and easily stored. It's that simple. They come in a variety of sizes and they're priced right. Without a doubt, the future of drop cloths has arrived, and it's CoverGrip™! 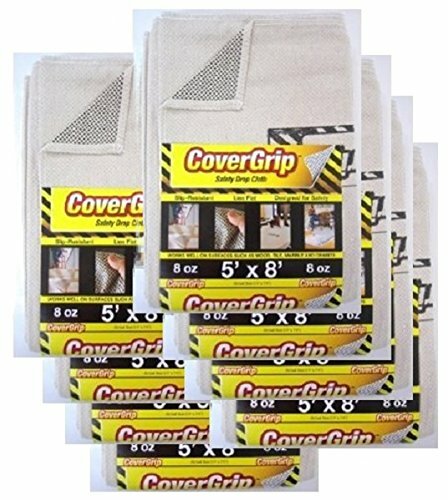 click on the CoverGrip link above to see more products from CoverGrip. If you have any questions about this product by CoverGrip, contact us by completing and submitting the form below. If you are looking for a specif part number, please include it with your message.